1. We streamline your workflow. We design our SSDs to use the latest NAND flash controller technology, focusing specifically on in-camera use, which means they work well under pressure, no need for OS level optimization that a standard PC SSD may need. The Professional Video Series SSD drives arrive shoot ready, so you can unbox, plug-in, and start filming. 2. We’re the most reliable. Have to shoot a long presentation? Our Professional Video SSDs work flawlessly shooting nonstop, filling the entire drive and never dropping a frame. 4K RAW recording requires massive storage, so we’ve specially developed the 1TB Professional Video SSD for 4K capture in RAW format! To ensure your Digistor SSD goes the distance, our developers employ improvements that extend the endurance of our SSDs with intelligent block management and wear leveling, as well as advanced garbage collection techniques. 3. We build with a locked BOM for quality and consistency with every drive. What goes on your SSD isn’t just your creative vision, it’s your whole team’s hard work. 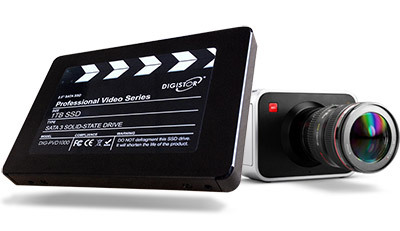 Digistor knows that filmmakers need the peace of mind that comes from an SSD that’s tailor made for Blackmagic cameras and recorders. Unlike off-the-shelf SSD brands with flexible bill of materials (BOM), which means they can change controller manufacturers, NAND flash, or Firmware with any given batch, we have a locked BOM, giving you reliable, glitch free performance every time. Once our drives are certified by Blackmagic, that certification locks our build. Have more questions about how Digistor Professional Video SSDs can enhance your Blackmagic experience? Give our team a call or drop us a line at sales@digistor.com.